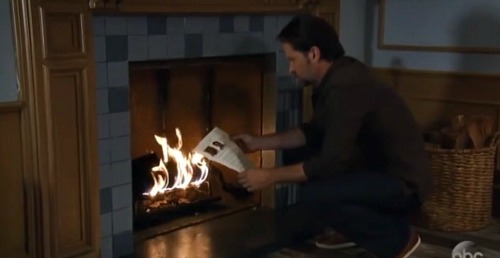 General Hospital (GH) spoilers tease that the war for the Jason Morgan title will get fierce. Current Jason (Billy Miller) is working especially hard to make sure he preserves his life. After Curtis (Donnell Turner) offers updates, Jason will pass along a new task. He’ll hope that they can finally prove he’s Jason and Patient Six (Steve Burton) is Drew. Unfortunately, it appears things aren’t going to go Jason’s way – at least not at first. General Hospital spoilers indicate that Jason will wrestle with his insecurities more and more. He’ll worry that everyone he holds dear could be ripped away. As Sam (Kelly Monaco) begins to believe Patient Six, it’ll really sting. Jason won’t know what he’ll do if Sam isn’t on his side. GH fans can expect BM Jason to channel that fear into determination. He’ll focus on getting the evidence he needs with Curtis and Jordan’s (Vinessa Antoine) help. They’ll complete a mission for Jason and it’ll lead to some huge surprises. General Hospital spoilers say Jordan will eventually make a tearful request. Why will Jordan get so emotional? Is it because she’ll believe Jason’s life is about to change forever? Perhaps proof will surface that points to Patient Six as Jason. As for the request, maybe Jordan will make Curtis promise to tell the truth. She may insist that they have to follow the law, no matter how painful it may be. Whatever the case, it seems Curtis will agree to do this on Jordan’s terms. He’ll be a man of his word on November 30. Carly (Laura Wright) will be her usual, loud-mouthed self on that same day. She’ll push current Jason’s buttons and it’ll lead to a heated confrontation. By the time their tense chat wraps up, Miller’s character will probably be shouting that he’s Jason Morgan from the rooftops. He’ll want to drive home the point that he’s Jason and he’s certain of it. A devastating bomb could drop soon after. Will Curtis deliver evidence that shows BM Jason is Drew? November 30 will also bring a crucial choice for Franco (Roger Howarth). He’ll change his mind about something important, so maybe he’ll decide he can’t lie anymore. Franco has been awfully nervous about exposing the real Jason’s identity. That might mean he believes Patient Six is the one and only. If Franco comes forward with those claims, it could back up Curtis and Jordan’s findings. In other words, it looks like Patient Six may win the first Jason Morgan round. 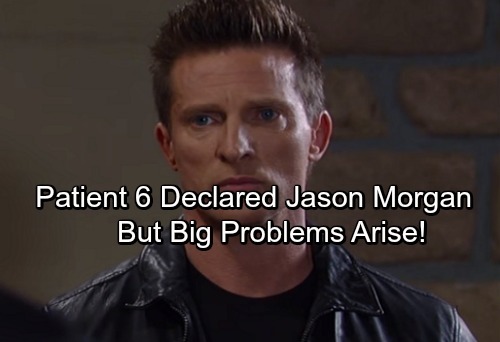 He might be declared Jason Morgan, but they don’t have all the facts just yet. There’s much more to come in this storyline. GH viewers could see their identities flip-flop several times. Andre (Anthony Montgomery) seemed to think P6 was Drew, but Franco’s behavior doesn’t line up with that. He might’ve been given false info. Plus, Tamara Braun’s character will have some juicy details to reveal. Patient Six may not want to get too comfortable with the Jason Morgan title. There’s no guarantee he can keep it! We’ll keep you posted as other General Hospital news comes in. Stick with the ABC soap and don’t forget to check CDL often for the latest General Hospital spoilers, updates and news.